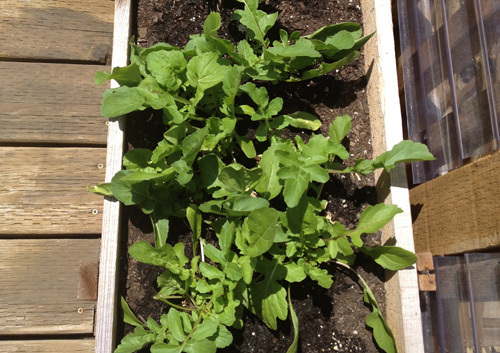 Spring is in full swing, and the arugula is growing like a weed on my deck garden. 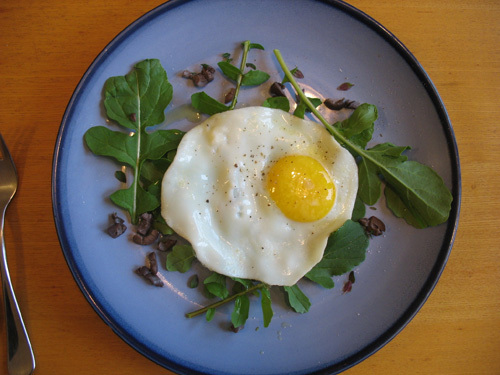 My new favorite (and quick) breakfast is a fried egg on arugula. Every morning I go out and pick 5-6 or the largest leaves, clean & dry them thoroughly, sprinkle with salt and drizzle with a bit of olive oil. Chop 2-3 pitted kalamata olives and fry a fresh market egg (1-2 minutes) to put on top. 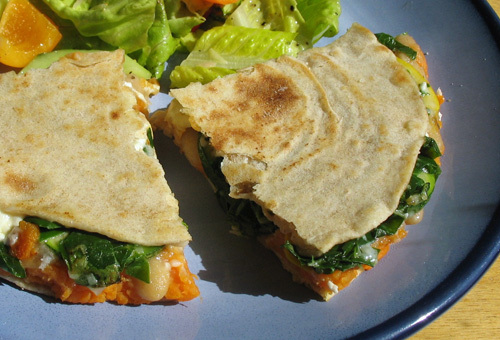 Easy, simple and delicious! 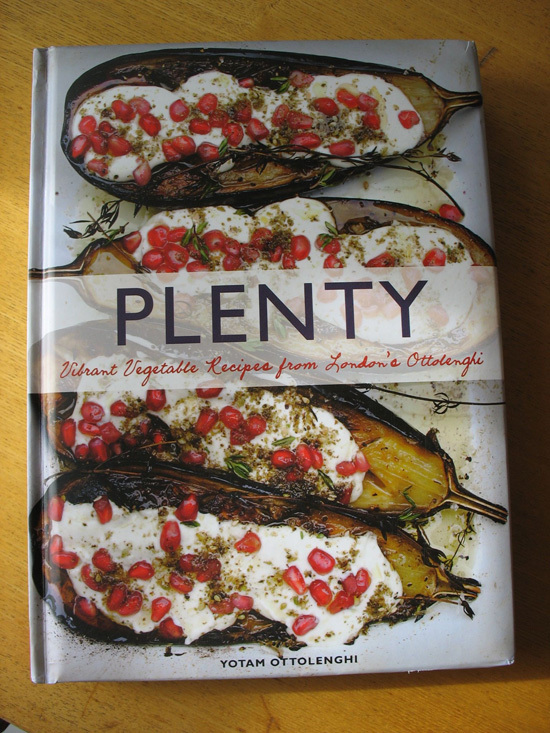 Ever since I received Yotam Ottolenghi’s cookbook for my birthday, Plenty, I’ve been obsessing. I think I could happily make a recipe from it each day until I’d made it through cover to cover. While I am not a vegetarian, I love cooking vegetarian fare and heartily believe it’s possible to develop deeply satisfying flavors without meat. It makes sense then that Ottolenghi’s book resonates for me as it is a “vegetables-only” cookbook (from a chef who is not a vegetarian) with recipes that combine unique flavors and techniques from around the world. 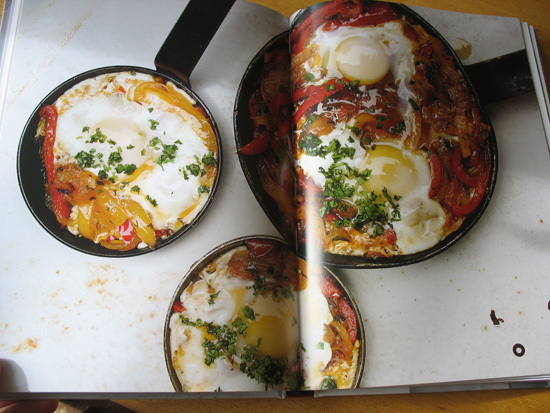 This recipe he calls Shakshuka, named for the man who served it in a tiny restaurant Ottolenghi found in Jaffa. 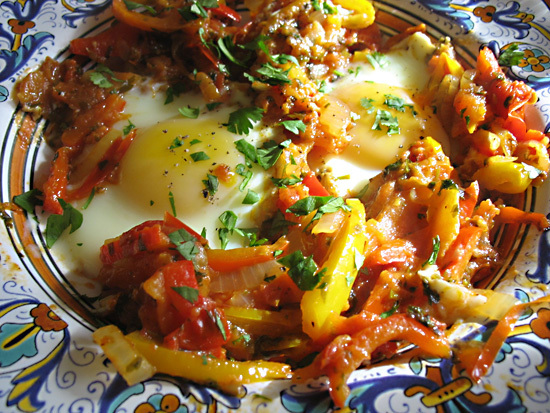 This North African dish is fantastic and the author’s version shows once again his mastery of melding a multitude of flavors and spices such that no one flavor overpowers. 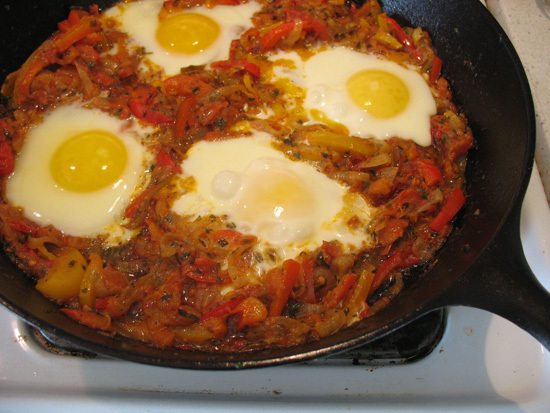 That said, I think it’s the saffron that ultimately lends this fried egg dish a bit of an exotic aura. I halved the recipe, and it serves a 4 or a generous 2. I don’t have more than one large cast iron dish, so was unable to fry up the portions individually as described in the recipe, but it was no problem to do all the eggs in one pan. I also didn’t have fresh tomatoes since they’re no longer in season, so I used a jar of my own canned tomatoes, plus I threw in a handful of cherry tomatoes I’d recently frozen (slightly defrosted in the microwave first). I didn’t have muscovado sugar on hand, so threw in a couple pinches of demerara sugar. Don’t let the list of ingredients deter you. Most don’t take long to prepare and you can start cooking down the onions while you prep the herbs. Serve with fresh hunks of toasted, crusty bread. Combined prepping and cooking time is about 40-45 minutes. 1. 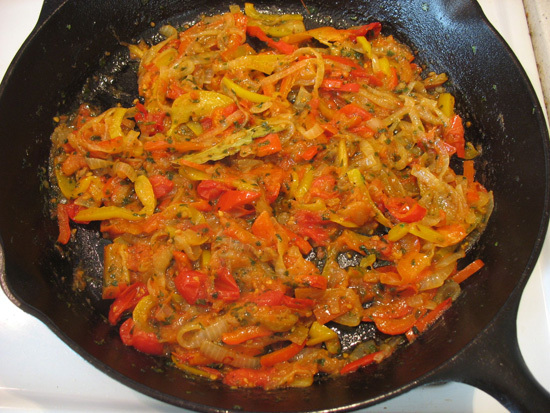 In a large cast iron pan, dry roast the cumin seeds on high heat for 2 minutes. Add the oil and onions and saute for 5 minutes. 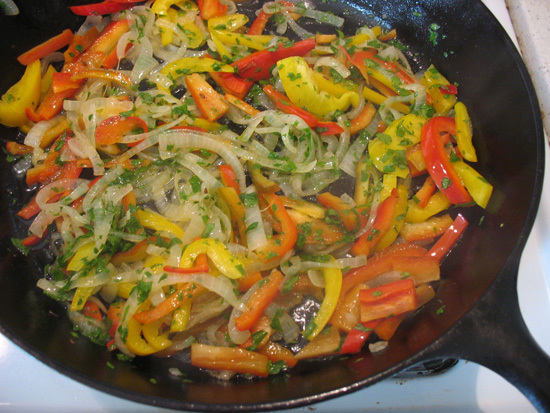 Add the peppers, sugar, and herbs and continue cooking on high heat for 5 to 10 minutes to get a nice color. 3. Remove the bay leaf, then divide the pepper mix among four deep frying pans, each large enough to take a generous individual portion. Place them on medium heat to warm up, then make two gaps in the peppers mix in each pan and carefully break an egg into each gap. Sprinkle with salt and cover the pans with lids. Cook on a very (!) gentle heat for 10 to 12 minutes, or until the eggs are just set. Sprinkle with cilantro and serve. Yum! Below a photo from the cookbook showing the individually cooked portions. Mark Bittman has definitely gotten me on the bean train. 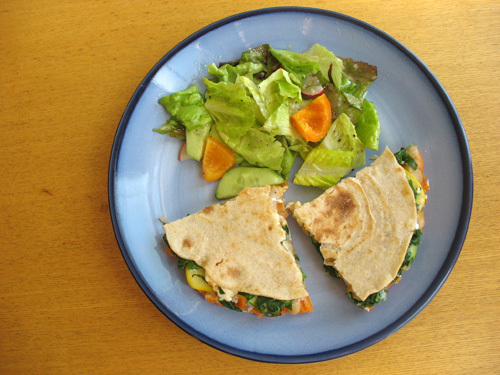 Having some black beans or white beans in the fridge allows for making quick and tasty meals on the go, such as quesadillas, soups, salads or sides. I recently discovered a love for white cannellini beans. The trick is using homemade chicken stock for the simmering (and not soaking the beans too long in the first step so they can absorb as much of the stock as possible in the second.) The whole process takes 2 1/2 to 3 hours, mostly unattended. 1. 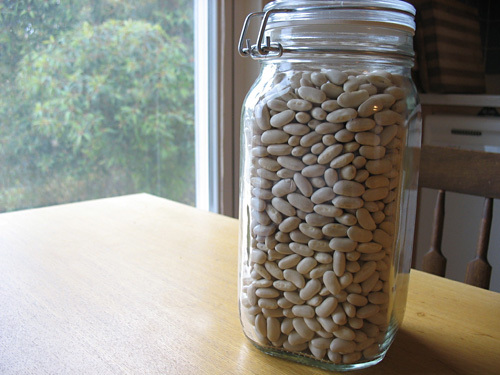 Rinse dried cannellini beans. Place in pot with cold water with the water 1-2 inches above the top of the beans. Bring to a boil. Boil for 10 minutes. Turn off heat, cover, and let sit about 1 hour. Taste a bean. The beans should be softening on the outside, but still a little hard in the middle, ie. not completely soft yet. Drain water from beans. 2. Add chicken stock to the beans, again with the water level about 1-2 inches above the beans. If you don’t have enough stock, add some water. Turn the heat back onto high to bring to a boil. 3. Meanwhile, in a separate saucepan, heat olive oil and saute onion, carrot and celery until soft. Add garlic and saute another 30 seconds or so. Stir the vegetables into the beans and stock. Add the bay leaf, thyme, a few pinches of salt, and pepper. 4. Bring to a boil. Reduce heat, partially cover, and simmer on low. Check every 10 to 15 minutes. When the beans are completely soft, but not falling apart, remove from heat. It usually takes between 30 minutes to an hour for the beans to completely cook. 5. Remove bay leaf. Taste and adjust seasoning as necessary. Use immediately or store beans with cooking liquid in the refrigerator and reheat as needed. (I find it’s best to only reheat the beans that I plan on using and leave the rest in the fridge, so they aren’t reheated multiple times.) Will last in the fridge for about one week. 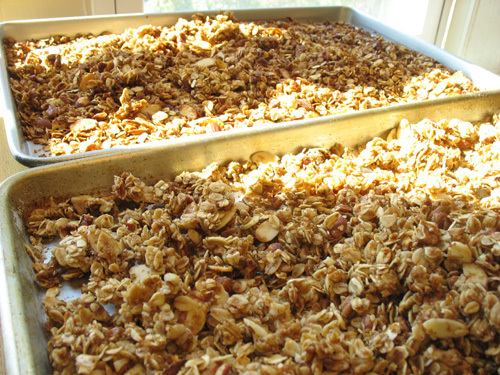 My boyfriend’s mom gave me this great homemade granola recipe. She prefers, as I do, not to include raisins or cranberries in the mix, although they are listed in the recipe if you like. 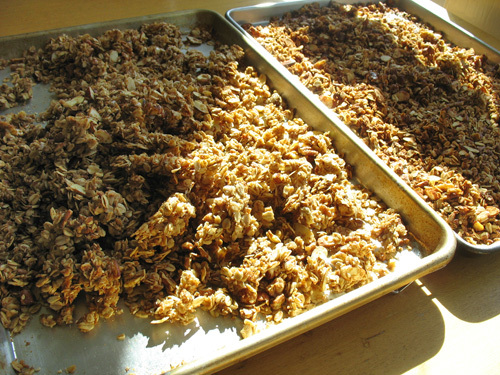 I found it to be a fine line baking the granola long enough to be crispy (how I like it)- versus a softer granola- without burning it. Luckily, I didn’t actually burn it, although it was close! 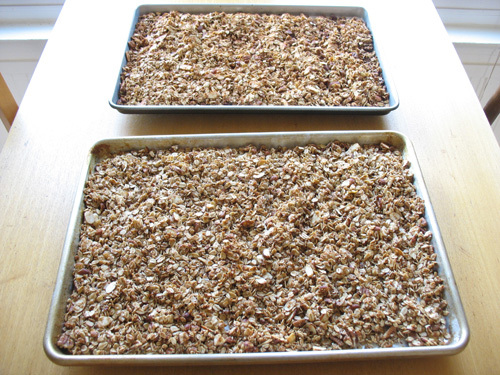 I used two types of cookie sheets that seemed to roast the granola differently. One pan roasted it perfectly, the other I probably should’ve cooked longer. In the end, I mixed the two batches together. 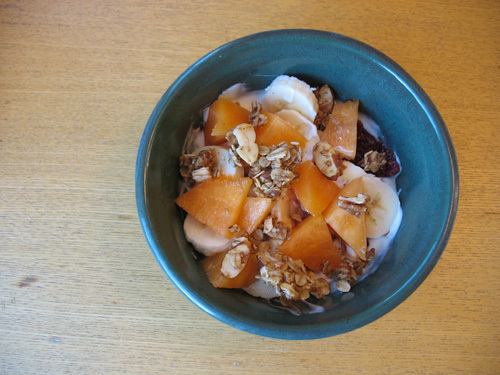 This recipe calls for baking the granola at 300 degrees, but I’ve seen others that cite a 350 degree oven, which might be an alternative worth trying. 1. Mix first 8 or 9 ingredients. 2. Separately, mix honey, oil, water and vanilla. 3. Pour liquid into dry ingredients and mix thoroughly. 4. Place on 2 rimmed cookie sheets and bake at 300 degrees for 15 minutes. 5. 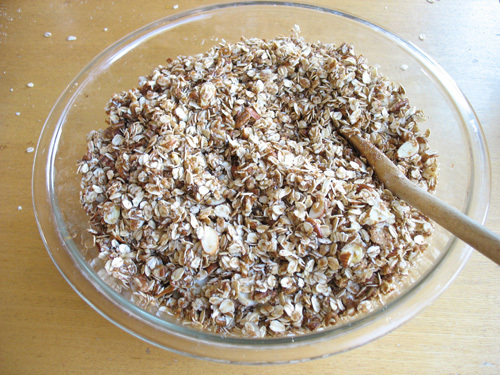 Stir and continue roasting until mixture is golden brown. 6. Remove from oven when ready and allow to cool on the pans. 7. 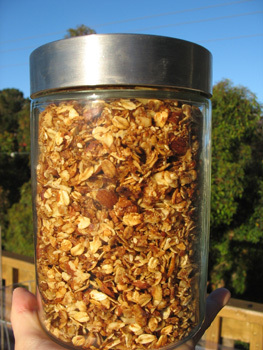 Break up granola (it will be chunky) and store in airtight containers. I do love a good brunch. And there’s nothing like roast potatoes for a deeply satisfying meal. A friend recently mentioned to me that she doesn’t bother to roast potatoes because it takes too long. I used to think this too, until I figured out that all you have to do is throw the potatoes in the oven first before prepping everything else. By the time you’ve got everything ready, the potatoes will probably be done, or almost done. With all your prepping completed, wait a few minutes if necessary to be sure the potatoes are fully cooked through, then quickly scramble, fry or poach your eggs. Before you know it, you’ll be eating in style. These roast potatoes should be crisp on the outside with a soft middle. It does help if you have one really good quality baking sheet. This can significantly improve your chance of perfectly browned and lightly crisped potatoes. 2. Peel 2-3 medium to large potatoes, whatever you have around, red or yellow are fine. 3. Cut potatoes into small squares/rectangles, about 1/2 to 1 inch. Any larger, and they’ll take too long to cook. It’s best if they’re all around the same size, so that they will take the same amount of time to cook. 4. Get your best baking sheet and coat with a bit of olive oil. Add the potatoes and toss on the sheet with a spatula, moving them around, adding a bit more oil until they’re lightly and evenly coated. Generously salt and pepper. Sprinkle on some dried or fresh thyme. Toss some more. Add a bit more salt. Toss a bit more. 5. Place the sheet in the now preheated oven. Check every 10 minutes and flip and stir with a spatula to make sure they’re browning. The potatoes should be cooked in 20-30 minutes. 6. 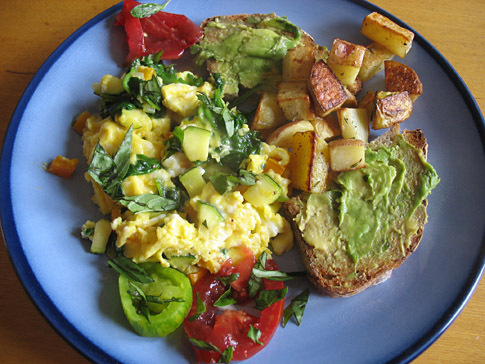 When the potatoes seem almost done, quickly cook your eggs and toast the bread. 7. Remove from oven when done and cover with foil if a few more minutes are needed to prepare the table. 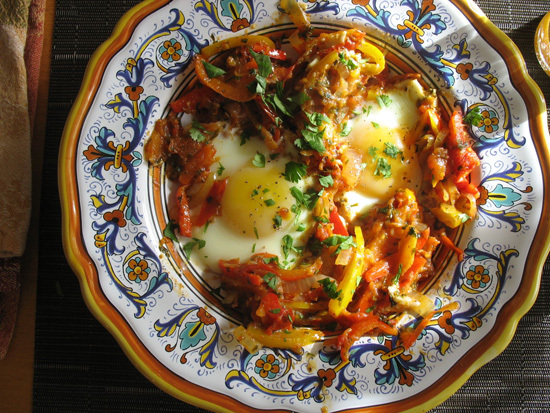 Serve hot with eggs, toast, fresh tomatoes, and sparking wine. Strawberries are out in full force, and we bought a flat from the farmer’s market over the weekend. We were mashing the strawberries to make jam when we realized that a Dutch Baby pancake was clearly in order for Sunday brunch. 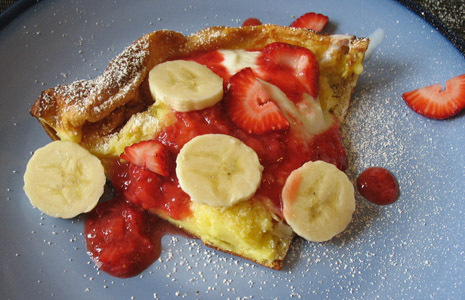 The “Dutch Baby” originated in Germany, and is made of eggs, flour, sugar and milk. This egg-rich pancake is cooked in the oven and puffs up at the last minute to make a beautiful airy “cake” that’s really more like a popover. It’s also the perfect compliment to fruit.